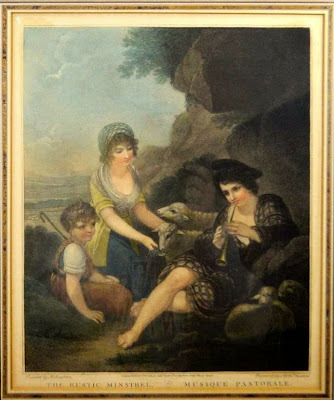 The pattern of a boy playing a pipe and a shepherd boy with his sheep was familiar to me. 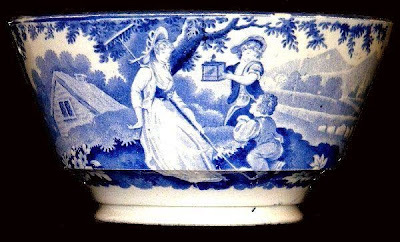 It appears on the small puzzle jug* above, and it also appears on George Phillips (1834-1847) "Pastoral Scene" pattern (seen below). However, I wondered about the boy with the birdcage, who takes the place of the shepherdess found on the plate. After a bit of sleuthing on Google and The Transferware Collectors Club Pattern And Source Print Database, I found the source for both the "Pastoral Scene" pattern and the boy holding the birdcage. I also found a waste bowl printed with a pattern that includes the boy holding the birdcage. 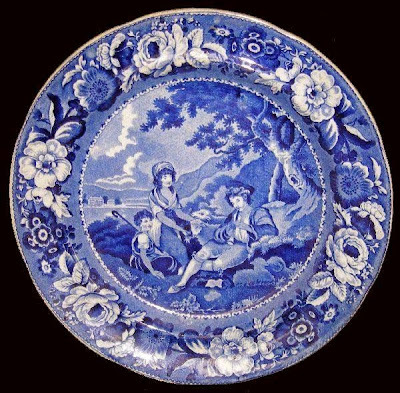 Both patterns were copied from the paintings of Henry Singleton (1766-1839). 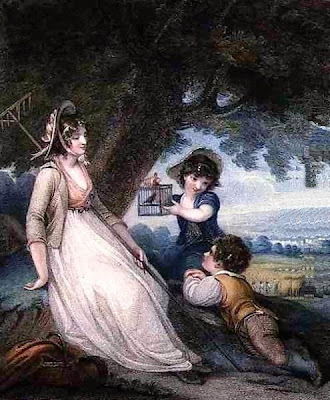 Edward & George Phillips (1822-1834) "Pastoral Scene" 10 inch plate/notice that the shepherdess has been replaced on the puzzle jug above by the boy holding the birdcage. Edward & George Phillips (1822-1834) waste bowl/notice the boy holding the birdcage. Henry Singleton "The Rustic Minstrel"
I am not sure why the potters removed the shepherdess from the puzzle jug and replaced her with the boy holding the birdcage. At least they copied from the same artist! I am also not sure who made the puzzle jug. Perhaps one of you will know. *Read about puzzle jugs in my blog post titled "Puzzle Jugs." That is so interesting to me as I am a big fan of Phillips. I do have a cup and saucer in the "Bird cage" pattern and the Pastoral scene. I would love to have a puzzle jug, in this pattern would be wonderful... Thank you for sharing. 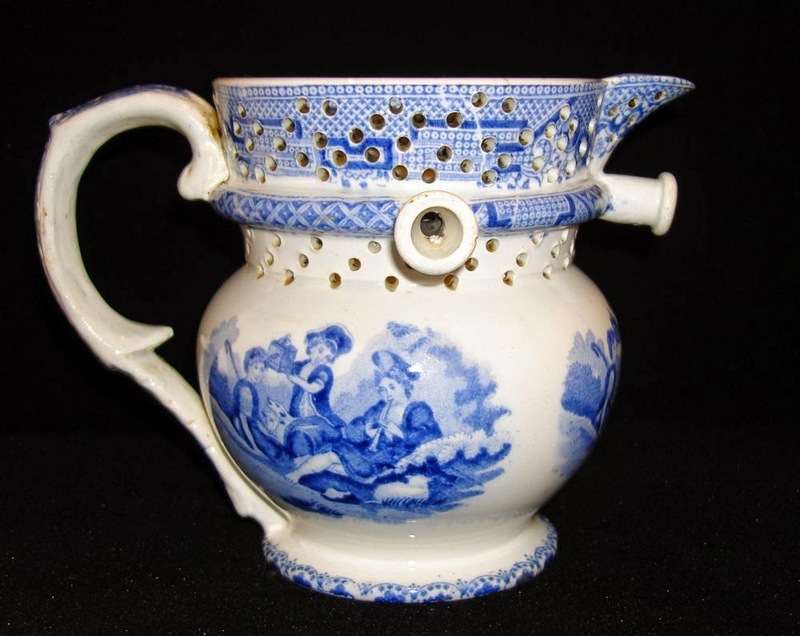 I love puzzle jugs and have a slipware example - I haven't tried pouring liquid out of it yet! 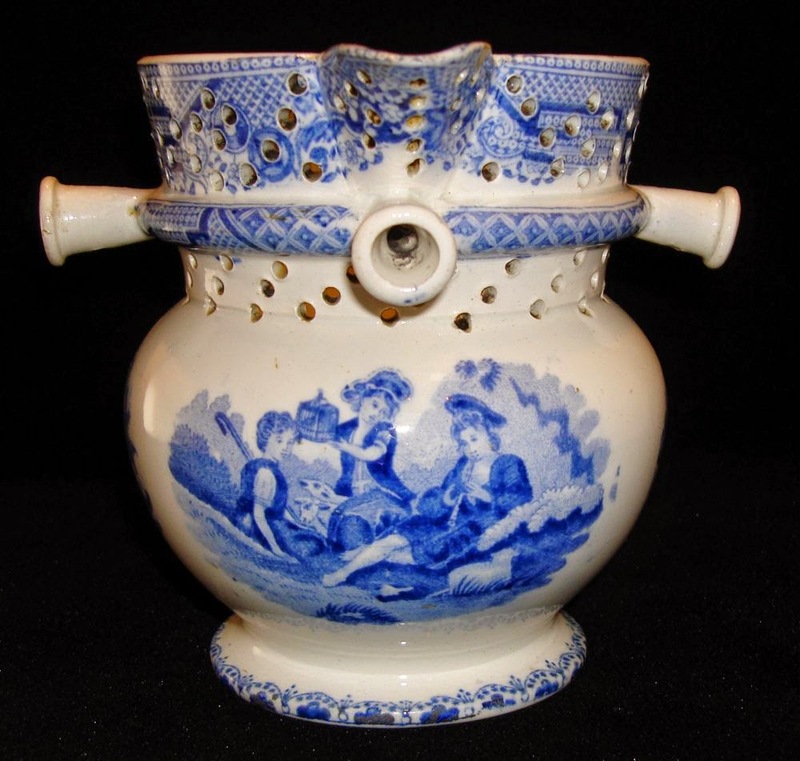 I had to look up what a puzzle jug was! Funny!